116 min. DreamWorks Pictures. Director: Tim Burton. Cast: Johnny Depp, Helena Bonham Carter, Sacha Baron Cohen, Alan Rickman, Timothy Spall. Stephen Sondheim musicals tend to be too smart, too offbeat, too edgy, too challenging for mass appeal. So Sondheim's loyal legion of fans girded their loins at the news that Sondheim's 1979 musical thriller Sweeney Todd: The Demon Barber of Fleet Street was to become a major motion picture directed by Tim Burton—American cinema's popular maestro of the weird and wacky—and his favorite star, Johnny Depp. What a pleasure it is, then, to report that Burton's version tends more to the abattoir than the amusement park, staying true to the story's aggressively downbeat but sublime fucked-up-ness. Burton's Sweeney Todd takes a little getting used to, but it's worth the effort. With his rock-star growl, Depp plays Benjamin Barker, who—under the titular pseudonym—pursues revenge against a corrupt judge (Alan Rickman, the king of velvety evil). The vehicle of Sweeney Todd's vengeance turns out to be a stroke of capitalist exploitation: a barber shop outfitted above the pieshop of one Mrs. Lovett (Helena Bonham Carter). The rub is that Todd slits his customers' throats and Lovett serves their flesh in bestselling meat pies. "They all deserve to die," Todd says of Londoners. "We all deserve to die." In forbidding Industrial Age London (announced by a credit sequence of blood in the gears), the general public comes off as stupid sheep—hungry consumers all too willing to take what they're given without question—selfish, sinning bastards, or both. It's an intriguing shift from the stageplay in which the chorus hauntingly tells "the tale of Sweeney Todd" with downtrodden faces and sad judgment. With their voices mostly eliminated, the extras seem more passively complicit in Barker's fifteen years of wrongful imprisonment. "It's man devouring man out there," sings Sweeney. "And who are we/To deny it in here?" The satire is an undercurrent in a story that's ostensibly concerned with its overriding Grand Guignol revenger's tragedy. There's also twin attempts at happy unions: a star-crossed romance between two ingenues (Jamie Campbell Bower and Jayne Wisener) and Mrs. Lovett's dream of a new family comprised of herself, Todd, and an orphan boy (Edward Sanders). The three newcomers all have terrific, seemingly trained voices, which sometimes make for unflattering comparisons with the leads. But if their voices are more delicate, Depp and Carter still carry their tunes, and they give the film a strong, steady emotional heartbeat. Certainly, only their presence could have made such a film commercially viable (and in a masterstroke of casting, Sacha Baron Cohen plays rival barber Adolfo Pirelli). A few weird change-ups of energy and Burton's signature strange costume design jar at first (especially Depp's raccoon eyeshadow and skunk hair), but in letting story and source material take precedence for arguably the first time in over two decades, Burton does a service to Sondheim. Fans will nitpick at what's missing (for the record, the sung version of "The Ballad of Sweeney Todd," "Ah, Miss," "Kiss Me," "The Letter" and "Parlour Songs"), but the choices are all ruthlessly judicious and made in concert with the heavily-involved Sondheim. The orchestration is excellent, as are the production design by Dante Ferretti and the bloodless photography by Dariusz Wolski, punctuated by geysers of red blood. Literally a bloody good musical, Sweeney Todd is not for the faint of heart—indeed, one of the film's principal pleasures is its subversive, Depp-driven wide release into the nation's multiplexes (to be a fly on the wall in Peoria...). The story runs on cross purposes, unfulfillable dreams, and dark ironies, and Burton relishes the throat-slittings like the Hammer horror-buff that he is. 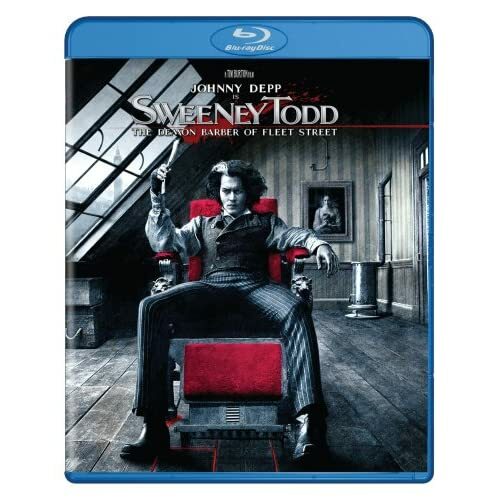 But give them a chance, and these "Demons will charm you/With a smile/For a while..."
Paramount has revisited Tim Burton's Sweeney Todd: The Demon Barber of Fleet Street on Blu-Ray, and the results are stunning. Obviously, the transfer comes from a clean print, and the anamorphic-widescreen image brilliantly retains a film-like image with unimpeachable detail and accurate color rendering. It's a beaut: Burton's dark and subtle shadings have never looked better on home video. The film sounds every bit as good, in a vigorous, all-important Bolby TrueHD 5.1 surround track that expertly mixes the music to full-bodied, rich effect. Paramount can be come=mended for a transporting A/V experience that presents the film in an optimal home-theatre form. The Blu-ray and two-disc DVD sets burst with bonuses; this is truly a loving special edition for one of the finest films of 2007. The nicely produced peek behind the scenes "Burton + Depp + Carter = Todd" (26:08 in HD) rounds up the creators and cast of the film, whose interviews are interspersed with pre-production and production footage, including a look at the recording session for the film. The highly entertaining interviews feature Stephen Sondheim, Tim Burton, producers Richard D. Zanuck and Walter F. Parkes, Johnny Depp, Depp's vocal producer Bruce Witkin, Ed Sanders, Alan Rickman, Jamie Campbell Bower, music producer Mike Higham, and an especially candid Helena Bonham Carter; they discuss, in depth, casting, preparation, Burton's approach to the material, and the actors' approach to their performances and Sondheim's complex music. 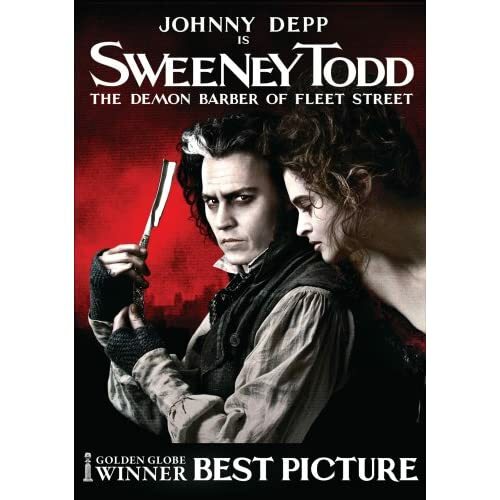 Presented in SD is the rollicking "Sweeney Todd Press Conference, November 2007" (19:42) with Burton, Depp, Carter, Rickman, Zanuck, and Timothy Spall. The participants are in fine fettle, both answering the questions and joking around quite a bit. "Sweeney Todd Is Alive: The Real History of the Demon Barber" (20:08 in HD) is a fantastic overview of the history (if any) and mythology of the Sweeney Todd character, tracing his historical inspirations, possible history, and literary iterations, including the 1970s Christopher Bond play and subsequent Sondheim musical. Participants include The Real Story of the Demon Barber of Fleet Street author Peter Haining, Dr. Rosalind Crone of The Open University, Burton, Oxford Dictionary of National Biography editor Dr. Lawrence Goldman, Louisiana State University professor Sharon Aronofsky Weltman, penny dreadful expert Helen Smith, and crime historian Donald Rumbelow. "Musical Mayhem: Sondheim's Sweeney Todd" (12:05 in HD) sits down with Sondheim, Higham, Parkes, MacDonald, and Logan to explore the origins of the musical, Sondheim's concept and approach, and its cinematic adaptation. 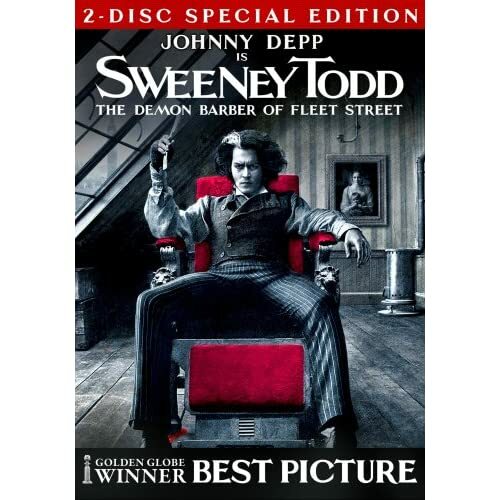 "Sweeney's London" (16:17 in HD) continues the work of "Sweeney Todd is Alive" by delving into the history of London in the 18th and 19th centuries, including more about the history of Todd, barbers in general, Fleet Street and other relevant London landmarks. The interviewees are Rumbelow, Haining, Goldman, and Crone. "The Making of Sweeney Todd: The Demon Barber of Fleet Street" (24:03) This half-hour making-of doc gives a strong overview of the film's concept, casting, music, production, and design, particularly the thinking behind the costumes of the main characters. Interviewees include Burton, Sondheim, Depp, Carter, Spall, Bower, Jayne Wisener, Sanders, producer/screenwriter John Logan, Zanuck, Parkes, producer Laurie MacDonald, associate producer Derek Frey, make up and hair designer Peter Owen, Witkin, Higham, costume designer Colleen Atwood, production designer Dante Ferretti, DP Dariusz Wolski, food stylist Katherine Tidy, property master David Balfour, and special effects supervisor Joss Williams. "Grand Guignol: A Theatrical Tradition" (19:16 in HD) provides an excellent overview of the "horror theater" tradition, from the Grand Guignol Theatre in Paris to today's Thrillpeddlers Hypnodrome theatre company in San Francisco. Participants include Cardiff School of Creative & Cultural Industries professors Richard J. Hand & Michael Wilson, The Grand Guignol: Theatre of Fear and Terror author Mel Gordon, Charles Nonon's great-grandson Eric Horton, Thrillpeddlers co-founder and playwright Daniel Zilber and Thrillpeddlers producer Russell Blackwood. "Designs for a Demon Barber" (8:56 in HD) gathers Atwood, Ferretti, set decorator Francesca Lo Schiavo and Burton for a more in-depth look at the film's set and costume designs, as well as the de-saturated color palette. "A Bloody Business" (8:53 in HD) allows prosthetics master Neal Scanlan to explain the blood effects and dummies. "Moviefone Unscripted with Tim Burton and Johnny Depp" (11:36) is an amiable and quite amusing chat during which the director and star ask each other questions submitted by fans online. It's only a shame it isn't longer. "The Razor's Refrain" (8:40 in HD) is a musical montage set to production stills. The disc wraps up with a slideshow-style Photo Gallery and the film's "Theatrical Trailer" (2:33 in HD). In whatever package you choose, Blu-ray or DVD, this one's a keeper, folks. All site content © 2000-2019 Peter Canavese. Page generated at 04/24/2019 07:25:42AM.